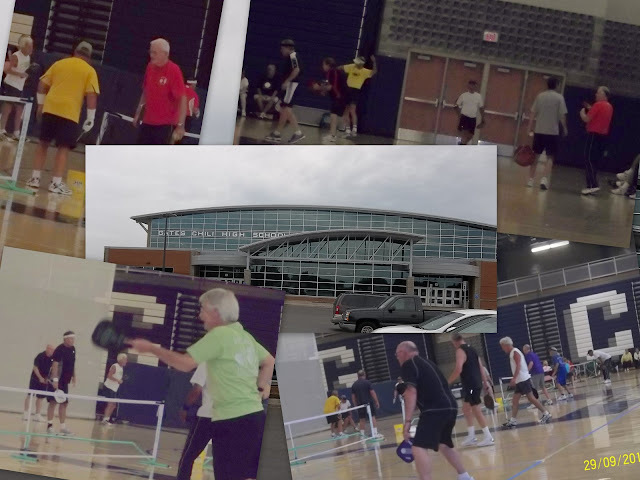 The National Senior Games Championships (NSGA) Winter Games took place from September 28th through October 2nd, 2011, in Rochester, New York at the Gates Chili High School's Spartan Stadium. Word on the street is that this was and absolutely fabulous state of the art facility. We extend a very special THANK YOU to all of our Atlantic South Players who made the trip to Rochester to experience this exciting event. There may have been more......but we know we had representation from players who live or have ties to: Naples/Cape Coral, Ft. Myers, Bradenton, Sebring and The Villages, FL, Opelika, AL, Flat Rock NC, Conway and North Myrtle Beach, SC. Jerry Eamer (Conway, SC) shared these photos and had the following to say about the games: "Was very pleased with how the games were run and how the local sports community worked with the local Pickleball group. Dave Thomas and his staff did an outstanding job." And we extend a special Atlantic South CONGRATS! to our ASR medal winners! And here's a link to Cape-Coral Daily Breeze.com who thinks their Sothwest Florida players are "golden"